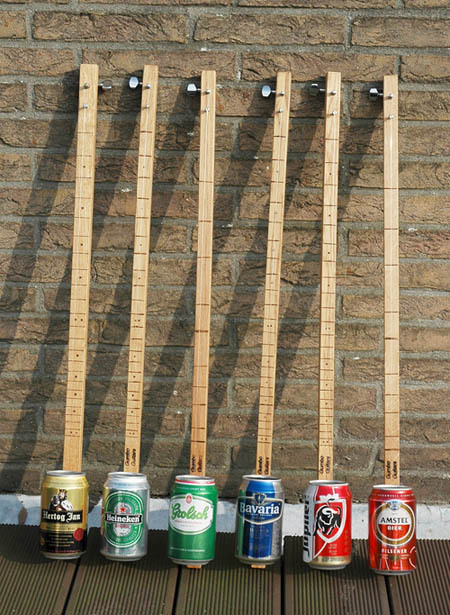 Gumbo Guitars is a Dutch company that sells hand crafted Roots Instruments built by its owner Servaas Bollen. 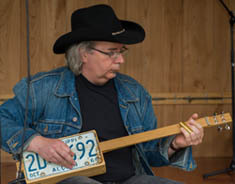 He started Gumbo Guitars in May 2013 and is inspired by the amazing story of how the blues historically found many creative ways to express itself. Back then, people who couldn't afford a guitar built it themselves from any available hollow object with any kind of string on it. Servaas now builds several types of these. 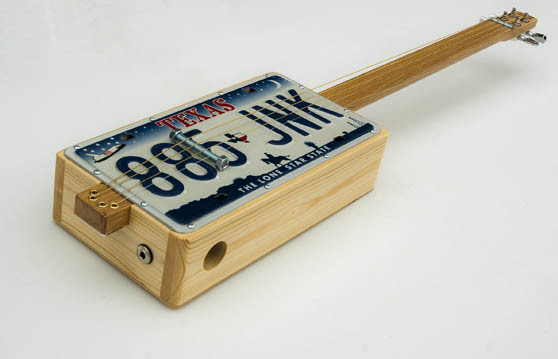 For example: Cigar Box Guitars, License Plate Resonator Guitars, Beer Canjos and also Stomp Boxes (a flat box covered with a license plate that you put under your foot to amplify your foot tapping rhythm). 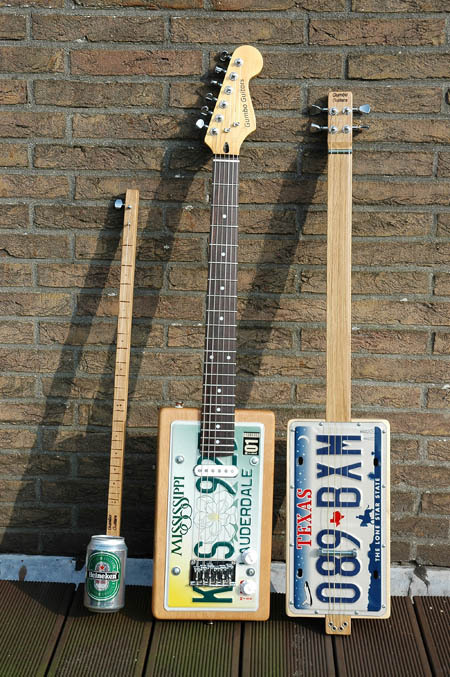 You don't have to be a guitar player to be able to play the Cigar Box Guitar or License Plate Resonator Guitar. It's pretty easy to get that authentic rootsy sound from it because they are tuned to an 'open chord', so when you strum all the strings you are already playing a chord. 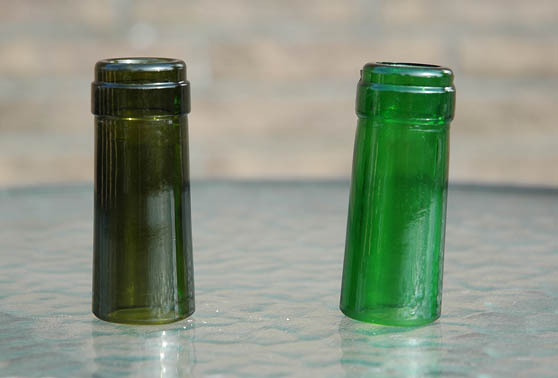 Now when you use a bottleneck or slide, you can play other chords or even melodies. Playing tips and lessons are widely available on Youtube. And by the way: All license plates used are road worn and have seen miles and miles of American highways, dirt roads or maybe even Route 66! 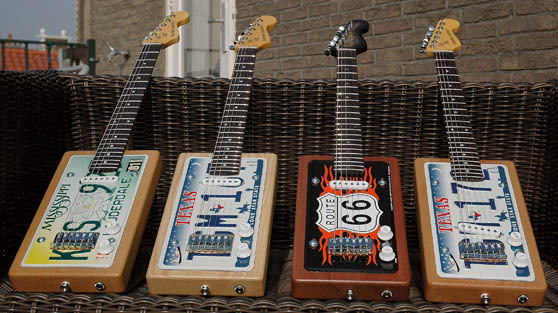 Gumbo Guitars mainly uses plates from states where the blues originated like: Mississippi, Tennessee, Texas and Illinois. On request it is possible to put any other plate on a Gumbo Guitar. If you have questions or want to order any of my products, please send me an email. You can pay by paypal or bank transfer. 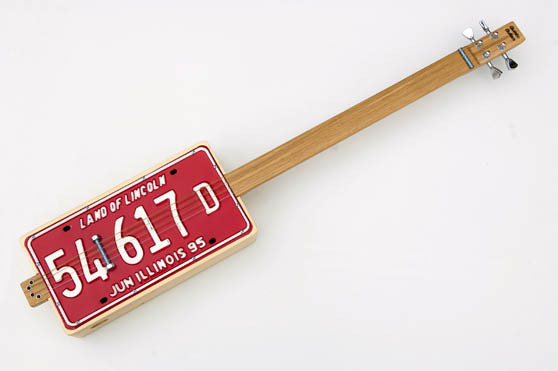 The 3 and 4 string License Plate Guitars all have a piezo pickup inside, so you can easily amplify them, but they also have a very nice acoustic sound. There are position/fret markers on the top of the neck (not visible on picture). 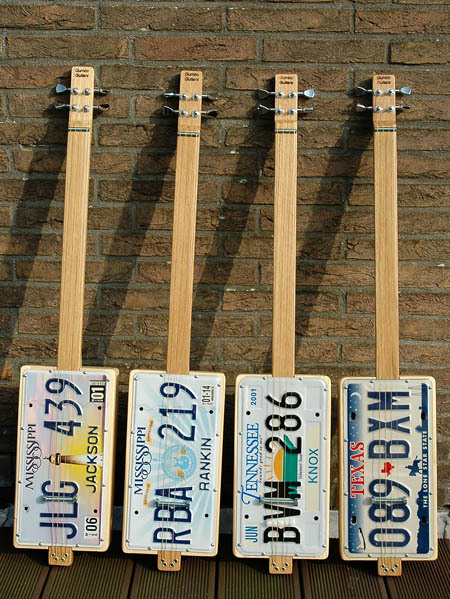 The 6 string License Plate Guitars are built like a 'normal' electric guitar from a solid piece of Mahogany, Alder or Ash wood with a strat-type neck and a single coil pickup. Other pickup configurations are also possible on request. 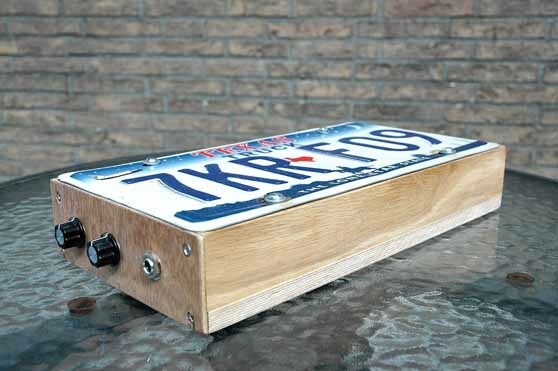 The License Plate Stomp Box is made with a bass guitar pickup under the plate and a volume and tone knob to shape the sound. You can amplify this without a preamp. 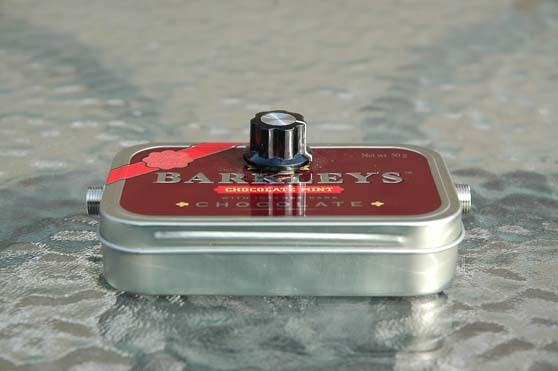 Gumbo Guitars also makes a little preamp in a mint tin that is specially designed for piezo pickups. Without it, these pickups can sound a bit thin. This preamp brings out the mid and low frequencies and gives it a fuller sound and as a bonus it also reduces feedback!